Our most ambitious Weblearning LMS plugin, over 2 years in development, the SlidePoint Online Presentation software for Weblearning is finally available. Currently, it is available solely as a plug-in for our Weblearning LMS/E-Learning System, but work is already underway for a stand-alone cloud-based version (will be hosted on www.slidepoint.net). 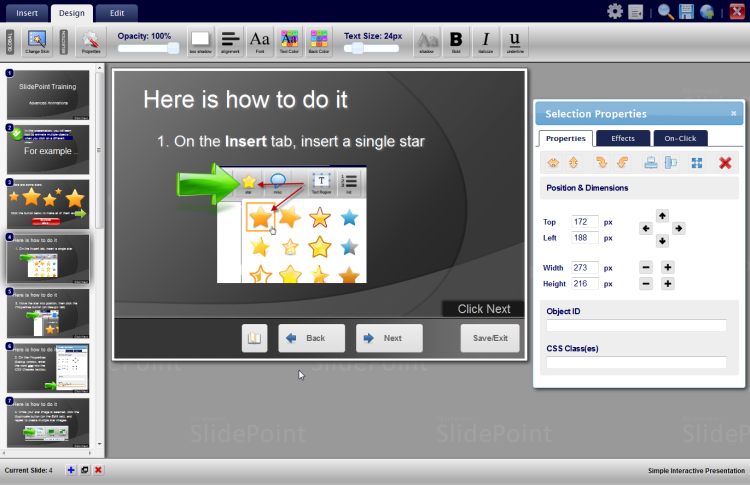 In short, SlidePoint enables you to visually create and assemble visually stunning, flash-like e-learning presentations, complete with images, text, video, narrations, and even animation effects – all online, and the end result does not require flash (in other words, works on mobile phones and tablets, including iPad)! You can, of course, integrate flash videos if you wish (as well as YouTube videos). Creating interactive e-learning presentations, slideshows, training tutorials, and marketing slideshows is easy with SlidePoint. The Weblearning LMS is a powerful, budget-friendly, easy-to-use Online E-Learning System for authoring, managing, and tracking online learning presentations and tests (including your SlidePoint Presentations). You can read the brochure, or to try it FREE, go to the Weblearning E-Learning System Sign-up Form. This entry was posted on Thursday, August 25th, 2011 at 2:42 pm	and is filed under ELearning 101, PowerPoint Quiz Maker, SCORM Quiz Maker, Weblearning. You can leave a response, or trackback from your own site.